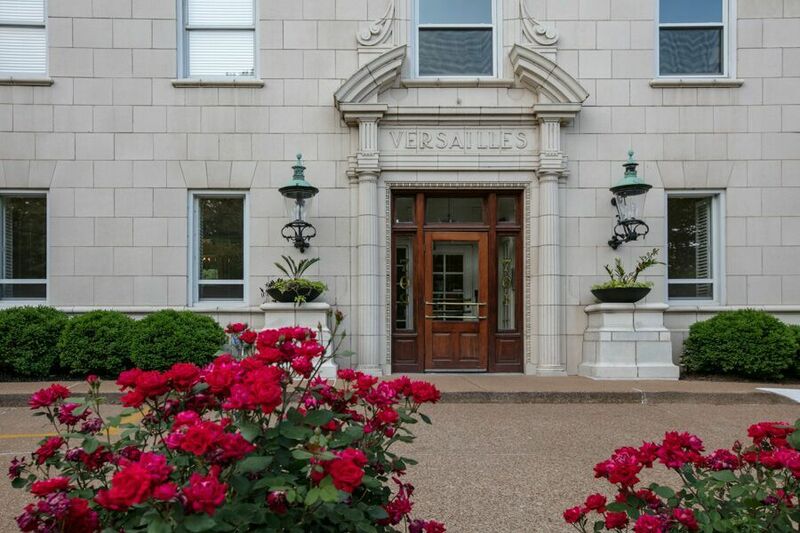 Breathtaking views from the top of the Historic Versailles building looking out over Forest Park, the Arch, Downtown St. Louis, and also the beautiful Clayton skyline. This new renovation of the top floor Penthouse suite is a complete gut and rehab of this now stylish, approximate 2,500 sq. foot condo. Open living room with box-coffered ceiling, gas fireplace & expansive windows. The dining room opens to the living room & kitchen area. The foyer is complemented with a custom built-in bar and Eurocave wine refrigerator. The kitchen is spacious and bright with a breakfast nook. The finishes include custom cabinets, quartz countertops, separate pantry, commercial grade Jenn-Air kitchen appliances (including gas stove). The master bedroom has a large walk-in closet and elegant bathroom with a dual sink vanity. The second bedroom includes an ensuite bathroom. Separate powder-room for guests. All bathroom fixtures are top-of the line Kohler. The condo has dark hardwood floors throughout. Includes one garage parking spot with an additional spot available for purchase. Laundry room in unit. Walk to restaurants, coffee shops, Zoo, Hi-Pointe Theatre, Cheshire Inn, Metrolink & more. 24-hr doorman & on-site management. Living Area: 2,500 Sq. Ft.